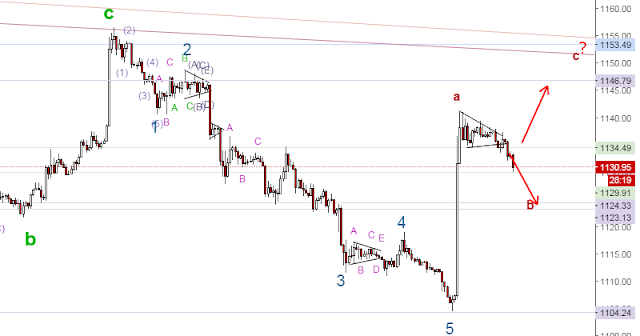 My elliotwave analysis and price action on the xauusd. for this chart. i would say that, the price may go up or go down.if the price go down.it will go finding it end of c wave correction in smaller degree. but if the price straight away moving upward after break the triangle. we will have to find whether there are some reversal on the candlestick that might indicate the downward movement. with base on my elliot wave analysis, the price may do a correction and completed at the area of 1129.90 support area.then the price will finding it C wave correction to the 1146.4 before continue moving downward. the other reason that my analysis says this is the 3 wave move, because of the completed 4 wave cycle on the higher deegree.